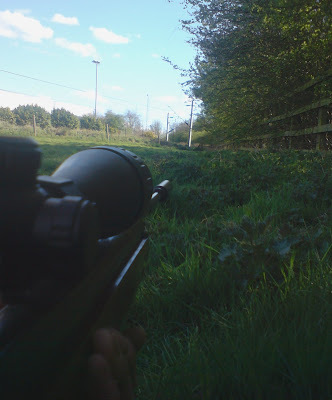 There's a discussion over on the Airgunbbs forum (here) at the moment about PCP's versus Springers - and, as is often the case, it's a very interesting one: pro's and con's all over the place. My ha'penneth worth amounts to little beyond, 'Well, I've got a springer and I've not got a PCP, nor, for that matter, the readies to buy one with'; so while all this is interesting, for me it's a little academic. If Bill Gates were to browse this blog and, overcome with philanthropy perhaps, he decided to deposit a large sum via the Paypal button to the left, then that might well change: I'd buy myself a Daystate Airwolf quicker than you could say "Daystate Airwolf". At the moment though, I'm still lugging the mighty HW80k around and, while I'm certainly managing to miss things with it, I'm definitely developing my upper body strength (since it weighs a ton). Today I went back to the same part of the field where, the day before yesterday, I'd had such unexpected luck. I camped down in the grass at exactly the spot where I'd got the last rabbit and waited. A mere ten minutes later one popped out and, after taking careful aim, I missed it completely. 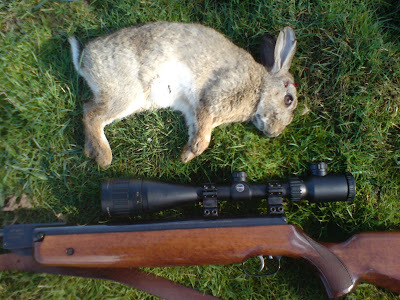 Remarkably, the rabbit didn't leg it (this may well be a testimony to the efficacy of the Weihrauch moderator I've got stuck on the end of the rifle: this does increase the length of the gun to the extent where I may be mistaken for a pole-vaulter when making for the fields but it does, also, seem to do a good job in reducing the crack from the shot). I broke the barrel to put another pellet in, however, and this did manage to frighten off the rabbit. I lay there for another twenty minutes and got bored enough to check my emails via my phone (all the time thinking, 'Ye Gods, this is a ridiculous thing to be doing while lying in a field'). I saw a rabbit emerge at the end of the field, about forty-five yards away, but it quickly scarpered. I decided to crawl up the field a way so I'd be handy if it reappeared and I'd just settled down there when two rabbits came running out of the bushes - they sat for a moment at forty yards and then set off to run again. I thought that they would run away from me, but no, they ran straight towards me and then stopped at about twenty-five yards. I took a shot at the nearest one and it went down at once without so much as a twitch. Taking a look at it, I noticed that I'd managed - more by luck than design - an almost textbook-perfect head shot. I've tended to think that shots of this kind are the preserve of supremely clinical pre-charged pneumatics only; in truth, I do tend to think that much of the talk on forums about hair-splitting accuracy tends to come from people that are able to shell out for a PCP and this can, I think, give those who can't afford one of these things a misleading view of what to expect from their humble springer. But this shot - forgive my immodesty - was, I think, a pretty good one. Acting on a - for me - most unusual charitable impulse, I gave the rabbit to a neighbour. They were chuffed - and I was chuffed meself at how chuffed they were. I'm out and about in the greater US! Great shot there HH keep up the good work. BTW never say it was luck, let 'em beleive it was by design! Remember though: Most all quality air rifles and firearms shoot better than the majority of their operators so you hit a point of diminishing returns, most especially for field usage. I've got a Weihrauch manufactured Beeman R-10 (not regulated down like your UK versions, it was actually the original factory hot-rod version of the R-1) that I bought when the design first came out ~1989-90 or so. Still makes reliable head shots and I still use the original factory iron sights. I've got friends that have pre-charged rifles and I haven't noticed them to be any more accurate than my R-10 in practice. If you want to get more accurate you need to start looking at target rather than field designs, methinks, rather than spring-air vs pre-charged. Still zaps pests, small game, and feral cats just fine. I guess Ive never bought a pre-charged of my own because the extra equipment and cost didn't seem to add much benefit to an air rifle for me. As long as you feed the old girl the pellets she likes she still drills holes in the same spot every time. Of course, in the USA I have a rather wide range of options much better than the best air rifle for longer ranges where you have all sorts of hassles even to own a .17 or .22 rifle. I've bought Holland and Holland Magnum elephant capable rifles for less than the new cost of some of the pre-charged air rifles out there. Different firearms laws make for different shooters, I guess. Thank you so much for these interesting and helpful comments Tom - they're really very enlightening! I do have a bit of a dose of the 'Grass is Greener' syndrome going on with all this, I expect. This may well have led me to understand - from reading UK forums - that if you haven't spent between £500 and £1000 on a PCP rifle - and all the kit that comes with them - then you can't really be shooting in a humane fashion solely because of the (supposedly) inherent limitations of the Springer. I certainly think I missed the first shot yesterday because I took the shot badly rather than it being due to any fault in the gun. I do have a hankering for a gun that can fire more than one shot, I admit, but if I think about it, it's more because I want those extra shots to mop up after my poor initial marksmanship. I should really just hunker down and learn how to make that first shot count - which means not snatching at shots and building good & consistent practises with grip, trigger-squeeze and follow-through. Always good to hear from you! Take it easy out there! I missed an entire elk once at under 75 yards in my earlier life because I miscalculated the fact that I was shooting up a steep slope and was poor on the trigger. I'll admit it right here. I missed something the size of a decent sized dairy cow because I made a mistake or two. The fact the rifle I was using wouldn't group better than 2" at 50 yards wasn't why I missed. I bet you'll do better continuing to hunt bunnies with the rifle you already know than skimping on veg and other things to buy a "PCP" as you lot call them. You can always buy a fancier rifle later. The interesting thing about your blog is that you've learned, mostly on your own without familial coaching, to be a reasonably successful hunter and you keep getting better at it. Chin Chin, mate, fine job you've done! Sorry, couldn't help myself, friend just got a "dealer sample for his business, and for all the work and money, words fail me. You've got to remember that people were successfully hunting rabbits for years with springers before PCP guns were available. Sure, they might be better but it doesn't mean that you *need* one to be a good hunter. I suspect that the better you become with your springer, the more you will gain from a superior gun when you can finally afford one.